Gary Foster revealed he was hampered by a stitch after narrowly missing out on winning the Hastings Half Marathon. The Hastings Athletic Club talent finished runner-up in yesterday’s race - just 21 seconds behind winner Josseli Polini - having led for the first eight miles. Foster said: “I felt good until about 11 miles in, but I got a bit stitchy in the stomach about the BP garage (on The Ridge in the seventh mile). Foster’s time of one hour, 11 minutes and 17 seconds was 18 seconds slower than he clocked when finishing third last year. 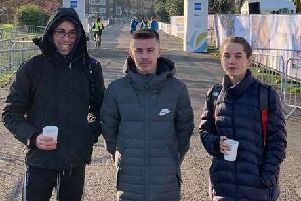 Two weeks previously, the 29-year-old clocked a PB of 1:09.28 at the Vitality Big Half on a fairly flat London course but in extremely windy conditions. Although slightly slower than last year, Foster has made huge progress in recent years and is a shining example of what hard work can achieve. To illustrate the point, he finished 193rd in the 2014 Hastings Half Marathon in 1:31.38. “It just shows if you listen to the people who have done it for years, you can make massive steps,” continued Foster, who works at Wisdens Sports Ltd in Hastings. “I have worked really hard. I get up at 5.30am every morning for the first run and go for a second run in the afternoon. Foster, who proposed to girlfriend Stacey Clusker in the finish area immediately after last year’s Hastings Half Marathon, received fantastic support around the course as the huge crowds cheered him on. Hastings Half Marathon provisional results (gun times) - top 10 men: 1 Josseli Polini (Victoria Park Harriers) 1:10.56, 2 Gary Foster (Hastings AC) 1:11.17, 3 Rhys Boorman (Hastings AC) 1:13.45, 4 Jeff Pyrah (Hastings AC) 1:14.43, 5 Robert Latala (Ashford & District RRC) 1:14.49, 6 Daniel Anderson (Hastings AC) 1:16.13, 7 Ian Blackham (Crawley Saints & Sinners Running Club) 1:16.41, 8 Max Thomas 1:17.58, 9 Chris Gilbert (Lewes AC) 1:19.00, 10 Patrick Davis (Highgate Harriers) 1:19.47. Top 5 women: 1 Heather Noone 1:21.44, 2 Rachael Mulvey 1:22.15, 3 Megan Taylor (Lewes AC) 1:27.10, 4 Laura Temple 1:27.45, 5 Linda Schofield 1:27.59.